“The new law will result in future cuts to your basic Medicare benefits.” True or false? By more than two to one, seniors said the statement was true. But the survey said that was wrong. “The new law is projected to increase the federal budget deficit over the next ten years and beyond.” By more than three to one, seniors said that was true. Wrong answer. “The health care reform law will cut Medicare payments to doctors.” Seniors said true by three to one. Wrong answer. The health overhaul law takes $575 billion out of Medicare over the next 10 years to pay for massive new entitlement programs. And the legislation keeps scheduled cuts in payments to doctors, which is why the Congress passed a separate “doc fix” bill in June to keep doctor payments from being cut by 21%. Seniors know you can’t take $575 billion out of Medicare and not have it affect their benefits. Many already are having difficulty finding providers that take Medicare. NCOA also found that seniors are not satisfied the information they are getting about the new law is “accurate and reliable.” Well the NCOA has certainly proved it is not the place to go for reliable information. This survey deserves to be tossed. It almost seemed like push-polling where the pollsters try to “re-educate” people through the use of survey questions. Seniors get it, but this is unsettling at best. Kaiser poll: The drumbeat continues, with yet another poll out today by Kaiser with a similar question. Kaiser asked people about elements not included in the health law and found that a majority of seniors believed that it cuts “payments to doctors who see Medicare patients.” Again the survey is wrong. See above. Only 38% of seniors view the new law favorably and 46%, unfavorably. But the release says their opinions “remain roughly split.” What? Look deeper. There is a reason that the administration and its allies are now targeting their re-education campaign on seniors. They will be hit hardest. And they know it. Kaiser found that 65% of seniors believe it will be harder for them to find a doctor willing to see them. Pollster.com compiles an average of all of the polls. Bottom line: 45% oppose and 42% favor the health overhaul law. And that’s before people start to feel any of the impact of higher health costs, cuts to Medicare Advantage, higher taxes, and onerous and expensive mandates on individuals and businesses. We know you will make up your own mind. Medicaid fraud: I was in Milwaukee on Monday and talked with a taxi driver — a 30-something naturalized American citizen. It turns out that his company, American United Taxicab, has a contract to provide non-emergency transportation services for Milwaukee’s Medicaid recipients. “It may be just me, but I don’t think it’s right,” my driver said. “Sometimes people have appointments with doctors that are 100 miles away and the trip costs several hundred dollars. And sometimes they have us drive to the other side of the city just to get a prescription filled. I did a little research and found that the Office of Inspector General (OIG) at the U.S. Department of Health and Human Services actually did an audit of American United and the $6.3 million in taxi fees it billed to Medicaid for trips in Milwaukee in 2005. The conclusion of the report: The OIG found that about 10% of the fares that year were ruled fraudulent since the beneficiaries did not receive any Medicaid-covered benefits on the days of their taxi rides. So right there, you see $694,066 in fraud. American United still has the contract. This is one small example of why it is urgent to reform Medicaid. 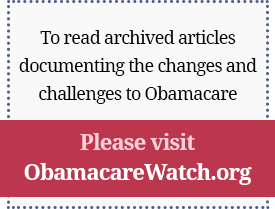 ObamaCare will add 16 million more people to this program without any structural reform. This abuse of the program makes my taxi driver and a lot of the rest of us mad. ObamaCare chart: The Republican staff of the Joint Economic Committee in Congress has produced an amazing chart that gives a glimpse of the complexity of the health overhaul law. As you will see, the Secretary of Health and Human Services is enthroned at the center of this bureaucratic maze. One of the truly amazing things about the chart is that the circles, and even the connection lines, reference the section numbers of the Patient Protection and Affordable Care Act of each provision depicted. As mind-boggling as it is, the committee says it still only shows about one-third of the provisions in the law. The famous chart about ClintonCare contributed to its doom in 1994, but this one is much, much worse. This is an heroic effort, and we expect to see it duplicated time and time again. People won’t be any less confused, but they will have a better understanding of the big picture of the incredible reach and impact of this hugely unpopular law. The Galen Institute is releasing a new rap song and music video today called “Feelin’ It” about the impact of ObamaCare on young people. The Free Market Boyz, a self-described group of “liberty loving young men,” first came together in the spring of 2009 to produce an award-winning rap entry for the Galen Institute’s “Do No Harm” video contest. “Feelin’ It” highlights many of the most damaging provisions for young people in the health overhaul law, including “half-trillion in brand new taxes,” increased health costs, and the individual mandate requiring people to purchase health insurance or face fines. Britain’s new coalition government is proposing a major transformation of its socialized health care system to give doctors much more authority over decisions involving their patients’ care, Turner writes. This most entrenched of government-run health systems is recognizing the importance of the doctor-patient relationship just as the U.S. is taking a sharp left turn toward more centralized government control over health care. The complex plan — which would affect only England — will need legislative approval to be enacted, but we should expect some version of it to pass, because it reflects a growing awakening in Europe to the importance of consumer control and choice. Proponents of ObamaCare claim that it will simultaneously provide millions of Americans with health insurance and reduce the budget deficit by hundreds of billions of dollars. Yet ObamaCare’s proclaimed budgetary discipline rests on unlikely assumptions and budget gimmicks — none worse than the CLASS Act, a national long-term care insurance program, Capretta and Riedl write. The CLASS Act is an ill-conceived concept that was included in ObamaCare only because of the appearance of surplus funding. In reality, CLASS is destined to run short of funds, creating pressure for another massive taxpayer bailout. The biggest threat to the long-term prosperity of the country is the massive unfunded liabilities for the nation’s major entitlement program. The last thing Congress should be doing is adding to the burden of future taxpayers, which is why CLASS Act repeal is the most fiscally responsible — and ethical — course to follow. The Biggest Tax Increase in U.S. History? The Justice Department now claims that the new health overhaul law’s individual mandate is a tax. If that’s true, it could be the largest in history — and it affects everyone, Matthews writes. A Kaiser Family Foundation survey found that average premiums for an employer-provided family policy, which is more likely to be the type of comprehensive coverage required by ObamaCare, was $13,375. That $13,375 family policy costs the same for both lower- and higher-income workers. So if the mandate is a tax, it’s equivalent to a 50% income tax on a family making $25,000 a year but a 10% income tax on a family making $130,000 a year. The Obama administration will argue that it is addressing the regressivity problem by proving a sliding-scale subsidy to insulate lower- and middle-income families. But the subsidies don’t negate the fact that ObamaCare imposes the tax on every individual in the country. It simply means that someone else — i.e., either employers or other taxpayers — will be paying the tax for millions of Americans. CBO’s latest projections again make it clear that the nation is rushing headlong toward a fiscal crisis, and the health overhaul law does nothing to head it off, Capretta writes. The primary threat to the nation’s long-term prosperity is runaway federal entitlement spending. According to the CBO, federal spending on the nation’s main retirement and health programs will jump by 5.6% of GDP over the next quarter century. Entitlement costs are set to rise so fast and so quickly that the implications for federal deficits and debt are staggering. If allowed to stand, the health law has dramatically reduced the flexibility of the federal government to respond to the coming budget crisis. It locks in massive new spending commitments, and uses every trick in the book to make it look like those commitments have been paid for. The truth is that the new law did not match the dead-certain new spending commitments. The health overhaul law authorizes Medicare to contract with accountable care organizations (ACOs) to provide care for enrollees. ACOs are designed to focus on delivering care to a particular population of patients, with an emphasis on improving their health and reducing the rate of growth of health care costs. This brief describes the ACO concept as defined in the health overhaul law and examines the challenges and opportunities facing health systems, physicians, administrators, insurers, patients, and policymakers as ACOs take shape. The brief also discusses models of different organizations that could be transformed into ACOs, such as integrated delivery systems, multispecialty group practices, physician-hospital organizations, independent practice associations, and virtual physician organizations. Allowing American patients to access medicines that have already been approved in Europe would increase regulatory competition, enable more patient choice, and potentially save the lives of those suffering life-threatening illnesses and who currently have no treatment options, Graham writes. During a 12-month period in 2008 and 2009, the European Union’s European Medicines Authority (EMA) and the Food and Drug Administration (FDA) approved a total of 39 new medicines. Fifteen were approved only by the FDA, 11 were approved only by the EMA, and 13 were approved by both regulators. In five of the 13 cases where the FDA and EMA both approved the medicine, the EMA was the first to approve, and it issued those approvals 552 days faster than the FDA, on average. If the U.S. government had allowed American patients to use new medicines that were approved by the EMA, but not yet by the FDA, American patients would have had faster access to 17 new medicines, out of the entire set of 39. The introduction of a pro-competition policy on hospital outcomes in England resulted in lives saved without raising costs, write economists Gaynor et al. In 2006, the NHS adopted a payment system in which hospitals were paid fixed, regulated, prices for treating patients (similar to the Medicare hospital patient system in the U.S.) and mandated that all patients requiring treatment be given the choice of five different hospitals. The reform provided patients with more choice, both via the manufactured five alternatives and the end of selective contracting, and moved hospitals from a market determined price environment to a regulated price environment. The government also introduced a new information system that enabled paperless referrals and appointment bookings and provided information on quality to help patients make more informed choices. Patients discharged from hospitals located in markets where competition was more feasible were less likely to die, had shorter length of stay, and were treated at the same cost.